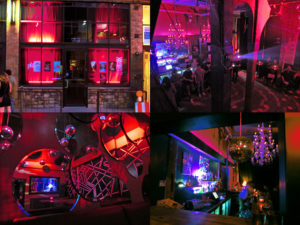 The Habitat Journey to Living Sound: A nightclub to remember | MUSICAlive! Cary Chang starts his musical exploration on the Habitat – Living Sound stage with these words, simply organizing the soundscape he’s creating into a trip with direction, unexpected treasures, curated experiences, and a buffet of flavourful opportunities. Not bad for a nightclub! Your guileless Writer, willing to admit his inability to distinguish individual tracks in the early evening (with what sounds like Cary’s seamless manipulation of layers and loops and themes), wonders what Cary thinks a “DJ” is doing now in performance? But, the set sounded like a lot more was going on than simple record-playing. When Cary was preparing for his set on a Thursday night, he used one of his many analogies to describe his process of music-sharing, which clarified his approach for us. “I think, especially in this technological age today, that there’s a lot of movement towards (more tech). And what I find is that people often need to be doing something as a DJ, like pushing some more buttons, and somehow that’s what makes them the artist. “The analogy I use to explain that is: to be an eloquent writer, you use the same words, but you use them in an arrangement that’s a novel, meaningful and different way. Carey, your Writer, meanders through questions, trying to get a grip on the DJ as performer; while Cary, the club owner, talks about modern DJing as still basically a song mixer: WHAT? “I don’t think there is a paradox in that: keep in mind, the slant that I’M coming at it from, I would not say is common: it’s more common with the upper echelon of old DJs. So I’M definitely coming at it from some degree of pedigree and legacy, and a lot of that has to do with the limitation of the technology. When you were playing with turntables and old DJ mixers . . . what I found is that constraint, in exploring it, created a real aesthetic for me that I subscribe to. So, much like a gymnast who has great poise, and every move seems like it’s the right movement, that’s kind of what I’m aiming for. He’s the Boss. Don’t mess with his groove.